You are here: Home / Recipes / Main Dishes / Fish Head Curry – Easy, Delicious, Make-from-Scratch Recipe! This delicious fish head (or fish fillet) curry is soooo good, you’ll be left wanting more! 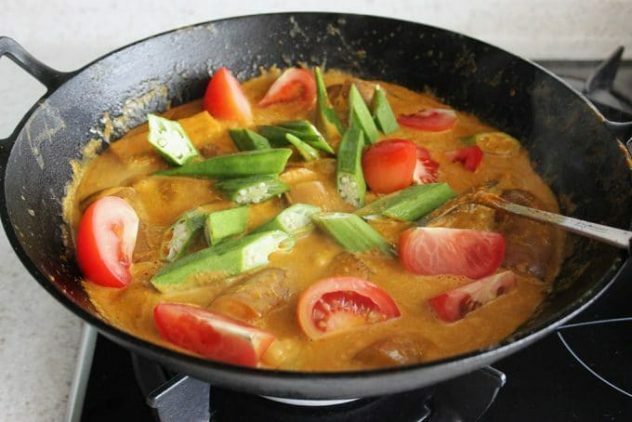 Here’s an easy, make-from-scratch recipe that makes a hearty, one-pot fish meal, richly flavoured with a tangy curry spice paste, coconut milk, tamarind juice, and fresh vegetables. Seriously. Too. Good. It’s great to be back in the familiar space of my kitchen in Singapore, cooking and sharing hearty, home cooked meal ideas with all of you! I’ve been meaning to work on a growing list of recipes to post, and this is one that’s been a long time coming. 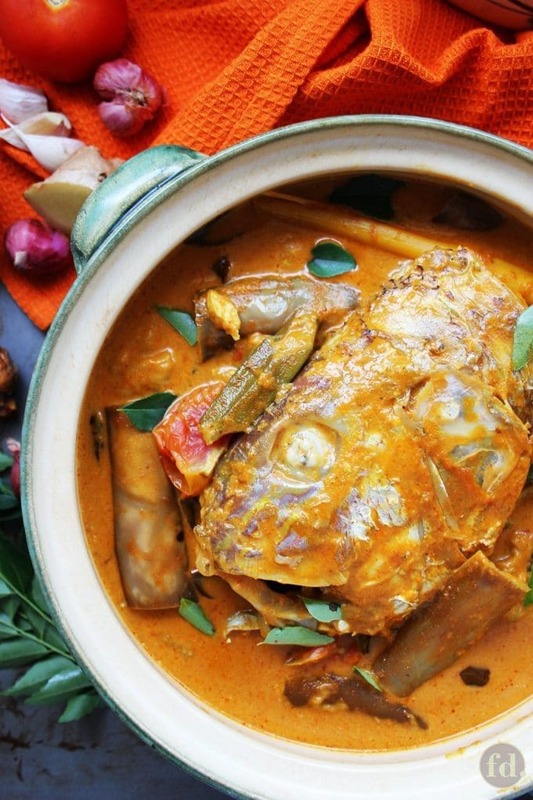 Here is one of Singapore’s most iconic and ubiquitous local food delights, fish head curry. I’m really excited to be sharing this fish head curry recipe which gives you the healthier option to make an easy, make-from-scratch curry spice paste. This way, you can avoid the ready-made pastes which usually come loaded with preservatives and flavourings. When made into a soupy curry with rich coconut milk and tamarind juice, this fish head curry tastes incredibly umami – it’s harmoniously sourish, salty, spicy, and savoury. It’s so delicious that we usually lap everything up – ladle after ladle of curry sauce with tender fish chunks and vegetables – with multiple servings of steamed white rice (because sometimes, seconds just aren’t enough), until there’s nothing left in the pot! If you feel a little squeamish about looking at a fish head with… gulp, bulging eyes…in your dish, you can always use fish fillet or steak, though traditionally, it is the fish head that gives this dish it’s authentic and strikingly iconic appearance. 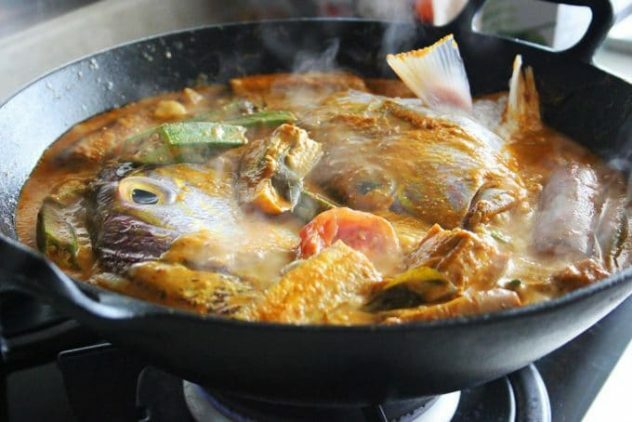 You see, the Chinese actually regard fish head as a delicacy, and it is believed that fish head curry here originated as an Indian curry infusing elements of Chinese cooking, to appeal to Chinese patrons in the early days. Or, if you love curry but just not with fish, try cooking up this delicious assam pork curry or chicken curry – you won’t be disappointed! A visually appetising dish like fish head curry might look daunting to the home cook, but it’s quite easy to prepare and cook, and takes just over an hour to come together. 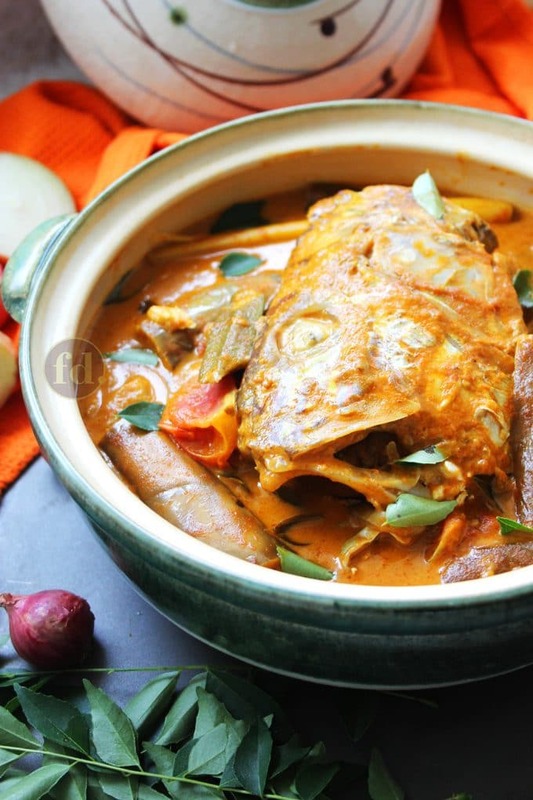 This really is a wholesome meal in and of itself, as fresh cut vegetables like egg plant, lady fingers, and tomatoes, are added and stewed with the fish head in the curry. I particularly love making fish head curry because you can easily make this fresh spice paste. 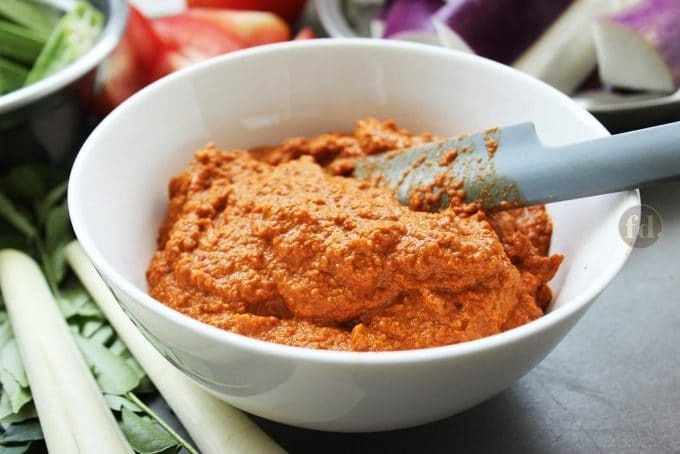 Common ingredients like yellow onion, shallots, garlic cloves, ginger, fresh turmeric, chilli paste, and fish curry powder, are all blended together into a smooth paste. This is a dish to impress your guests with, when you don’t want or need the shebang of preparing a multitude of dishes for entertaining! 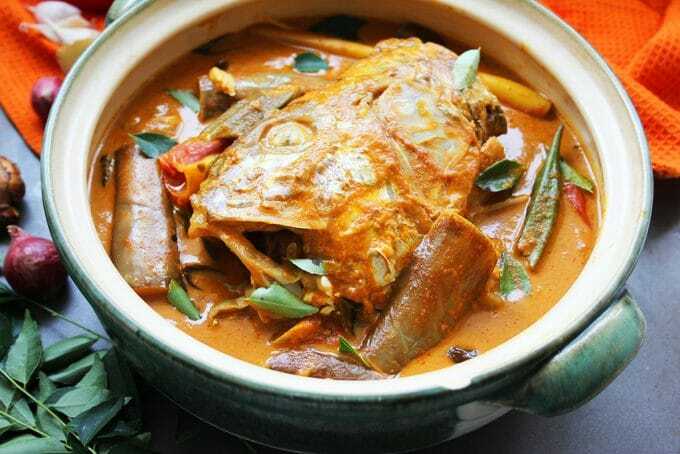 Even better, fish head curry never fails to make a dramatic appearance, especially when served in an earthen clay pot, and will leave your guests wondering how you pulled off a dish looking that elaborate! Plus, it’d be a great conversation starter and talking point at the table! 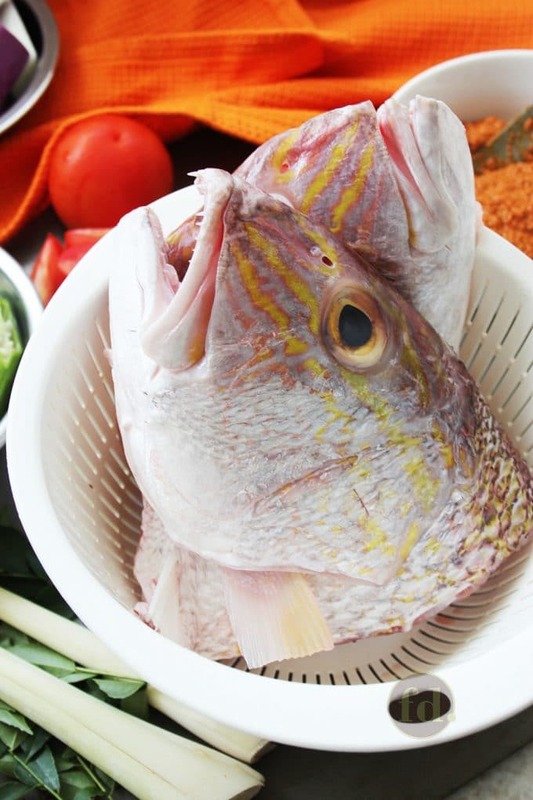 Not all types of fish are particularly suited for preparing fish head curry. I’m quite clueless when it comes to the variety of fishes used in cooking, but I’ve navigated around my ignorance by relying on fishmongers at the local wet markets here. If there’s a fishmonger you frequently buy your supply from, the good gentleman or lady should be able to give you a couple of good options for fish head curry. The popular choices here are Sea Bream (ang go li), Red Snapper, Crimson Snapper (ang sai/ang koi), Emperor Red Snapper (ang hu/ang koi), Golden Snapper/John’s Snapper (ang zho/ang zhor) Mangrove Red Snapper (ciak zho), and Russel’s Snapper (ang zho kee/ang zhor kee), just to name a few. 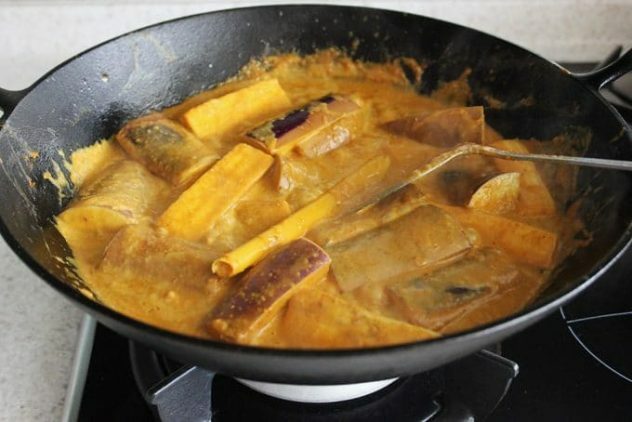 These fishes are considered superior choices for curry as they are fine and tender in texture, do not readily fall apart and quickly absorb the flavours of the curry. If these fishes are not easily available in your locality or country, the next best options are fishes with neutral to mild flavours, like the garoupa or grouper, though these are more flaky in texture. Whatever your choice of fish head, do ask your fishmonger to remove the scales, gills and/or bits of innards, and cut the head in half for you. When at home, you can clean up the fish further by scraping off any dark, inner membrane, as well as any bits of blood. Rinse the inside and out with cold water, let it drain or pat dry with paper towels, and your fish head is now ready for cooking. So, want to know just how easy you can master a dish of fish head curry? Let’s start! Make the fish curry spice paste. 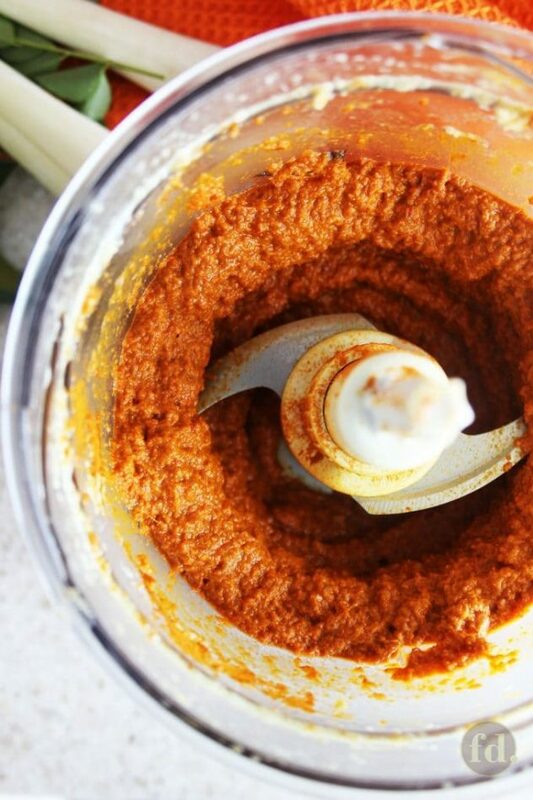 I like to make my kitchen tasks easy, so I use a food processor or blender for all my pastes! 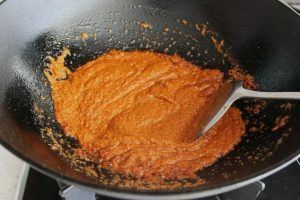 Put all the curry spice paste ingredients, except the fish curry powder and chilli paste, into a blender. Pulse or blitz (add 2 to 3 tablespoons of oil to help grease the blades if necessary), until you get a fairly smooth paste. Add the curry powder and chilli paste, and blend until well combined. Have your curry spice paste, liquids and vegetable slices all ready. Heat up a wok with 6 tbsps of oil over low-medium fire. When hot, add the spice paste and stir fry, stirring continuously around in the wok so as to avoid burning the paste. If the paste gets a little dry, add 1 to 2 tbsps of oil. Stir in the salt and sugar, and allow the paste to cook through gently, becoming fragrant and aromatic, a process that might take between 8 to 10 minutes, or longer. 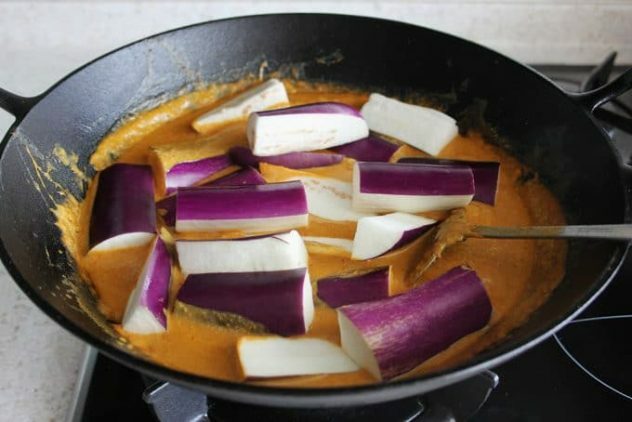 Don’t be tempted to cut back on the seasoning, as salt heightens the flavour of the curry paste, while sugar adds depth and deepens its colour. Once the oil starts to seep through to the top of the paste, and bubbles a little around the edges, add the bruised lemon grass and curry leaves, and fry till fragrant. Next, pour in the thin coconut milk and tamarind juice. Increase heat to medium-high and allow mixture to come to a gentle simmer (but do not let the mixture boil vigorously). Add eggplant slices, and simmer for a few minutes, or until they begin to soften. Next, add the lady fingers, tomato wedges and fish head halves. Continue to simmer for 12 to 15 minutes, or until fish head is cooked through. This is when you’ll want to do a final taste test. 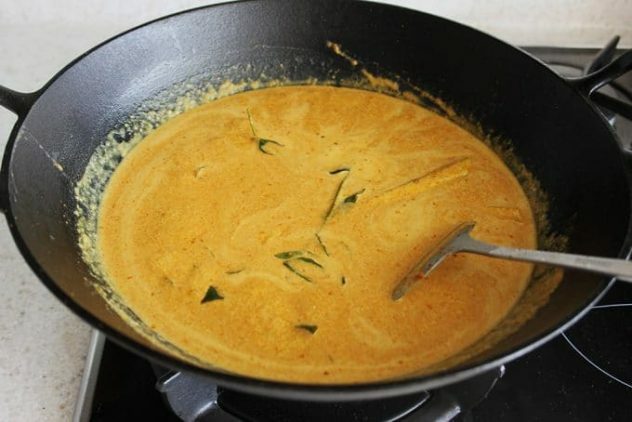 Add the last ingredient, thick coconut milk, if your prefer your curry more creamy or ‘lemak’, a Malay word meaning ‘rich’ tasting. Add salt and sugar to taste (more salt if not salty enough, more sugar if too sourish or too salty). A good fish head curry should taste rich or lemak, slightly salty as well as sourish (tangy), and have the consistency of a thick soup. Once cooked, turn off the heat, and dish out immediately into a large, deep dish like an earthen clay pot. Heads up, everyone! Fish head curry is now served! 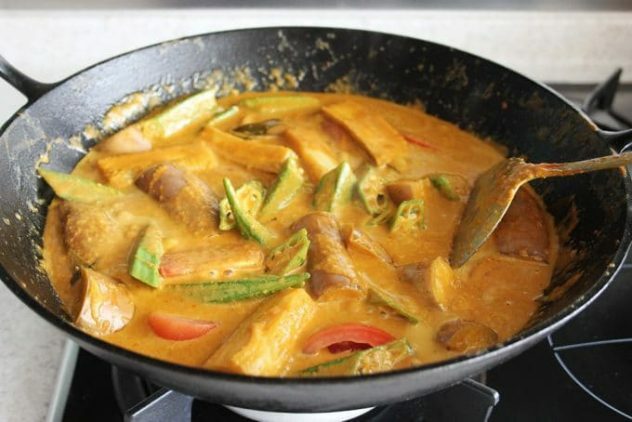 Here's an easy, make-from-scratch recipe that makes a hearty, one-pot dish, rich with the flavours of curry spice paste, coconut milk, tamarind juice, and fresh vegetables like eggplant, okra and tomatoes. Place cut shallots, onion, garlic, ginger, and turmeric in a food processor, add 2 tbsps of oil to grease the blades, and blend until you get a fairly smooth paste. 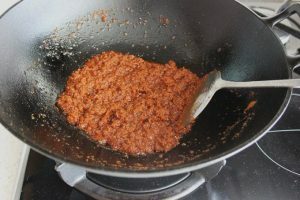 Add curry powder and chilli paste (add between 3 to 5 tbsps, depending on how spicy you like it) and pulse until well combined. Heat up 6 tbsps oil in a wok over low-medium fire. When hot, add the spice paste and stir fry, stirring continuously around in the wok to avoid burning the paste. If the paste gets a little dry, drizzle in 2 - 3 tbsps of oil. Stir in salt and sugar. 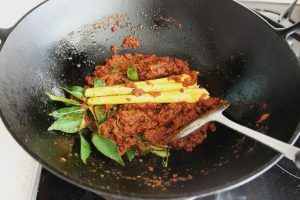 Allow the spice paste to cook through gently, becoming fragrant and aromatic - this may take 10 minutes or longer. 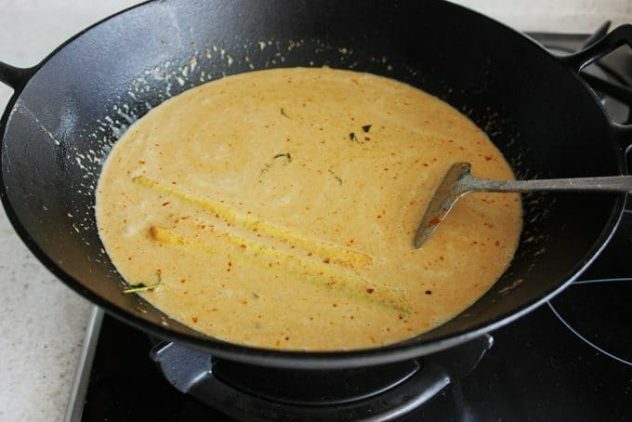 Once the oil starts to float to the top, and bubbles around the edges of the paste, stir in lemon grass and curry leaves. Stir fry for a minute or until fragrant. Stir in thin coconut milk and tamarind juice. Increase heat to medium-high, and allow mixture to come to a gentle simmer. Add egg plant, and simmer for a few minutes. When egg plant start to soften, stir in the lady fingers, and tomatoes. Then add the fish head halves, cheek side facing up. Add a little extra water, if sauce becomes too thick, or is not enough to coat the fish head to cook it. Cook for 12 to 15 minutes, or until fish head is cooked through. Do a taste test: if your prefer your curry more rich-tasting or creamy, add thick coconut milk to desired level of creamy richness. Add salt and sugar to taste (more salt if not salty enough, more sugar if too sourish or too salty). A good fish head curry should taste rich or lemak, slightly salty as well as sourish (tangy), and have the consistency of a thick soup. Do you have the chilli paste recipe that you put inside the Curry Fish Head? The dish is still in my mouth my brain yummmmmm ….. going to try your recipe minus the spiciness for my kids. Inshyallah soon ???? Hi Alison, goodness me, I need to have my eyes checked cos I totally missed replying to you, my apologies! I was attending a full-time professional bakery course at the time which was crazy stressful and intense, so I must have slipped this by. Thank you so much for the wonderful feedback on the carrot cake, glad it was such a success for you!???? Too bad, I didn’t see your lovely cake though, I think the picture didn’t come through. Yes, yes! I’ll definitely try to work out a recipe for coffee walnut cake soon, were you thinking of a buttery one or a sponge one?? Hi Celia, I know this is way off topic but could you maybe make a recipe for Coffee walnut cake …..I tried lots of recipe but they never turn out right so hopefully you could create a recipe ❤️Just a suggestion I absolutely love all your cake recipe I tried your carrot cake recipe and it was a huge hit THANK YOU SO MUCH ?Hehe I attached a picture of the cake picture I couldn’t recreate the look (I’m talking about the decorations) so I was hoping you could ?? Thank you, Philyn?. Would have loved to eat and slurp on this one along with you! Ooooh…. 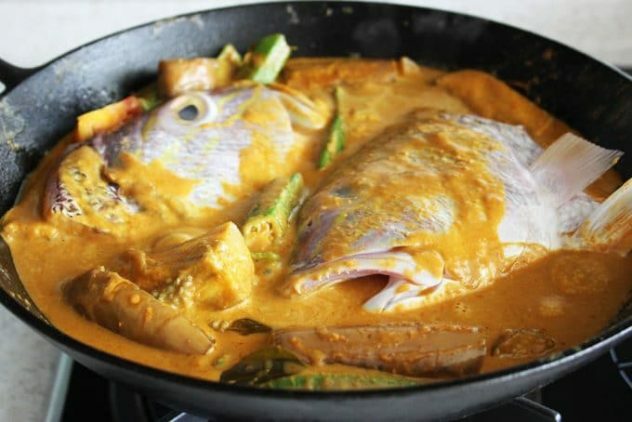 this fish head curry looks so delicious! Pity I didn’t get to enjoy this dish.